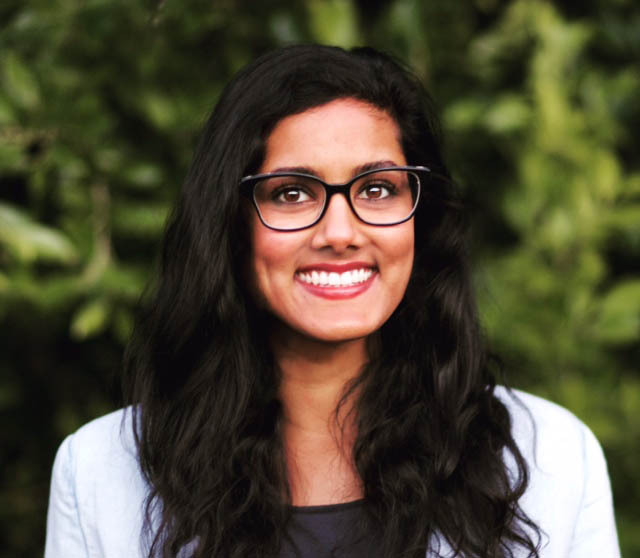 While studying the human impact of coral reef ecosystems in Cairns, Australia, during her undergraduate years at Virginia Tech University, entrepreneur and environmentalist Shilpi Chhotray discovered a newfound respect for the integral role played by the oceans in the overall well-being of our environment. An East Coast native, Shilpi earned a Master of Earth and Environmental Resources Management, with a concentration in Marine Affairs, from the University of South Carolina, and a Bachelor of Science in Environmental Policy and Planning from Virginia Tech University. Now located in San Francisco, Shilpi thrives on the innovative and creative spirit of the Bay Area, where she has had the opportunity to work on a range of projects dedicated to addressing marine environment issues. Shilpi was further inspired by a trip to India in 2014. While there, Shilpi met with local seaweed farmers, many of whom are women, and learned more about the sustainable harvesting process and the health benefits of the plant. 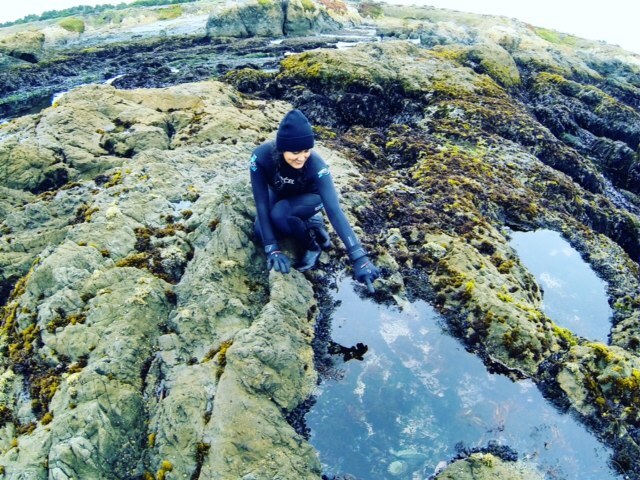 Channeling this knowledge and her passion for preserving and sustaining the oceans, Shilpi founded Samudra Skin & Sea, a skin care line that is 100% organic and natural and uses seaweed harvested off the coast of California. Through Samudra Skin & Sea, Shilpi hopes to bring awareness to ocean conservation and the sustainable seaweed processes. In addition to Samudra Skin & Sea, Shilpi also works for Future 500, an NGO that specializes in stakeholder engagement, where she direct the oceans program with a focus on coalition building, and serves on the Advisory Board of the Whale Sanctuary Project. Learn more about her what motivates Shilpi as well as her newest endeavor, Samudra Skin & Sea. What was the inspiration behind Samudra Skin & Sea? My work with seaweed was game-changing and something I’ve continued to pursue learning more about. When I was researching the environmental, economic, political and conservation aspects of seaweed, I also learned of its incredible health benefits , especially for skin, the biggest organ in the body. Seaweed is rich in essential vitamins, antioxidants and minerals that feed and nourish the skin. I was amazed by its inherent sustainability characteristics , as it needs only water and sunlight to thrive and can be grown without pesticides or harmful contaminants. And the more sustainable, the healthier it is for our bodies and planet. I was also inspired by it’s ability to help provide farmers, specifically women, with green jobs that can help combat the pressures from climate change and over fishing. After a trip to India in 2014 where I observed the harvesting process used by women seaweed farmers, I was determined to incorporate this sustainable harvesting process to produce high quality, organic skincare. Samudra, which means ocean in Sanskrit, was born from my dream of blending global economies, cultures, and environments as well as the mind, body, and spirit. Why focus on ocean conservation? What is the importance of oceans in the overall schematic of our environment? Our oceans need more attention. The oceans cover more than 70% of our planet yet only 2.8% is protected. I’ve always been fascinated by and deeply respectful of the diversity of marine life, from charismatic whales and dolphins to colorful corals and seaweed, which provide food and shelter for countless marine species. Our monumental, dynamic, blue planet requires greater protection by governments, citizens, and especially the private sector, which is responsible for the extraction of marine resources and pollution through chemicals and plastic contaminants. Samudra’s role in providing clean, organic, and pure skincare is just as much about healthy skin as it is about healthy oceans. We want to educate consumers and encourage other companies to do the same. I believe the interconnections of people and planet connecting the dots between environmental and social issues, which are more in sync than we know. Through seaweed we can empower people and communities, and safeguard our marine resources for generations to come. How do you harvest seaweed? How do you transform the seaweed into the end product? Our seaweed is local, edible grade, hand harvested, and dried in the sun. We calculate our harvest volume based on growth rates and densities that do not interfere with the marine environment. By working with a commercial harvester who has innate knowledge of the marine ecosystems (he has been harvesting on the coast of Northern California for over 20 years), we know exactly what goes into the process first-hand. There is only so much you can learn from books and experts that spend more time in academia than actually in the water. I am a firm believer in integrating local and traditional ecological knowledge wherever possible. Furthermore, by harvesting myself, I have learned more about the ecological integrity of the process- providing assurance that our seaweed is handcrafted with conservation at the forefront, which goes hand-in-hand with producing the highest quality attainable. Tell us more about the products offered by Samudra. Healing moisture-rich body butter. Featuring pure Mendocino seaweed, shea butter, and avocado oil. Rejuvenating facial cream. Featuring pure Mendocino seaweed, hibiscus extract, jojoba seed oil, and rosemary hip extract. Detoxifying facial mask. Featuring pure Mendocino seaweed, betonite clay, activated charcoal, and colloidal oatmeal. Lather-rich soap bar for hair and body. Featuring pure Mendocino seaweed, avocado butter, shea butter, maracuja and argan oils. Biodegradable. What is your favorite product offered by Samudra? I love all of the products, but I’d have to go with the body butter. It’s been an incredible solace for my dry skin and eczema. 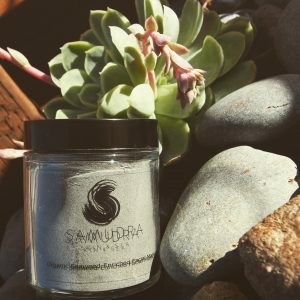 I have a number of food sensitivities and allergies that cause skin rashes so the Samudra line has been a turning point in my skincare routine since it’s plant based, consisting of high quality essential oils and pure ingredients. I’m not one to wear makeup, so having healthy and glowing skin via my soaps and creams is important to me. What can we expect from Samudra in the next year? We debuted our introductory products in April this year and are now in four San Francisco-based locations. We’re planning to launch our online shop this August and continue to expand our retail locations. We look forward to continuing our NGO partnerships – to date we are working with The Marine Mammal Center to raise awareness about the rescue and rehabilitation efforts of seals and sea lions on the California coastline. Secondly, we are partnering with 5 Gyres on a consumer action campaign to call attention to the state of microbeads and plastics ending up in our oceans. My parents, like most Indian immigrants are extremely hard working and have a strong work ethic that has been engrained in my sister and me. They have also supported me as I followed a not so traditional career path – I think they recognized from the time I was a young professional that I was not going to be fulfilled in a traditional 9-5 or following someone else’s direction forever. In the early days, it was more challenging, but they’ve really opened up to my ideas and approach to social entrepreneurship.I have an incredible network of strong women in my life- friends, family, and other female entrepreneurs who constantly provide me with inspiration and confidence in a heavily male-dominated society. Finally, my fiance who is a creative soul- an artist and engineer, is Samudra’s biggest fan and constantly encouraging me to follow my dreams and reach my goals, however unattainable they seem at the moment. I respect his views and opinions immensely so it means the world to me when we share ideas and collaborate. Increasingly today, younger generations in the South Asian community are choosing nontraditional careers. What words of wisdom do you have for those, particularly women, who aspire to pursue their interests and embrace an entrepreneurial spirit? Listen to your inner voice, more often than not, society and the status-quo will tell you otherwise. Do what makes you You. With hard work and a supportive community, you can make your dream a tangible reality. Especially for women of color, the time is now to demand gender-equality in the workplace and this goes towards entrepreneurship too, we are still fighting an uphill battle to earn the same opportunity, pay and arguably respect, for the SAME work to our male counterparts. A united voice alongside female-led entrepreneurship networks are necessary, if not essential, to paving the way forward. Images provided by Samudra Skin & Sea and Shilpi Chhotray. Article appears in August 2016 Desh-Videsh magazine.